Bushels of apples picked from the mature orchard in Stelle, IL. Beautiful pears from the orchard at Falcon Ridge. Beyond the goat barn, on the way to the northern pastures of the Falcon Ridge property, there is a small orchard. It is a wild spot on an otherwise shipshape farm where tall scraggly grasses and outsized shrubs make nice hiding places for wandering wasps, small toads and myriad other creatures. An untamed stand of grape vines (with the grapiest grapes I’ve ever tasted!) keeps watch at on one end while the other recedes into the forest. Great swaths of light to pour through breaks in the tall trees surrounding the orchard. Several pear trees, tall and bushy, grow in the center with the height and the heft of many tough years. And on the day we ventured there, they were laden with pears. 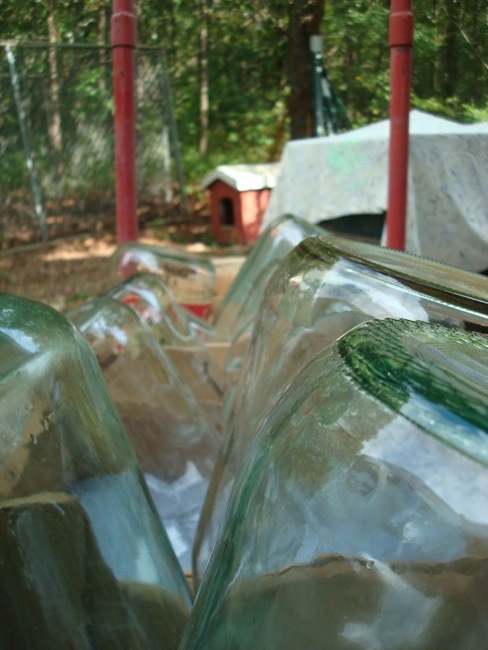 Rows of glass jars and jugs wait to be filled with delicious cider. About a week before we were to make cider, JC and I went there with Brandon, a friend of and sometimes-farmhand at Falcon Ridge farm, the gator, a trailer and several baskets. 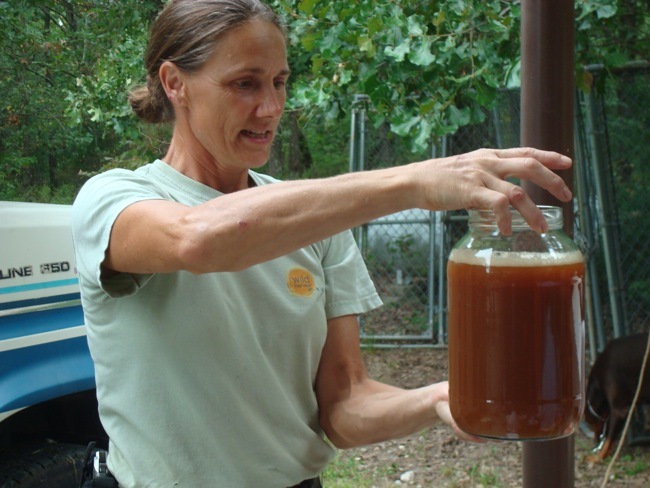 We pulled pears out of the trees, some of which were so ripe that bees had burrowed into them to drink the sweet juice. The yellow, classically shaped variety were so DEE-licious! Now, I’m not a big fan of pears but these were almost buttery in texture, with large sluices of refreshing juice, and a clean sweetness with no hint of tartness nor dryness. In other words, pears the way you dreamed they could be but never actually are. There were also loads of the harder, rounder, greener type,which intermittently blushing and dimpled by the probing of Asian beetles. All in all, we gathered about 10 bushels worth. Later, Wendy and I scoured the property’s few apple trees for fruit but unfortunately, they had a fairly poor showing this year. We spent the next week alternating baskets of pears in and out of the refrigerator in the spacious guest apartment Wendy had built into her cavernous metal barn. Apparently, the coldness helped the pears to ripen. When the new cider press gear had arrived from Amazon and JC set about assembling and cleaning it in preparation. Meanwhile, Wendy and I went about setting up a cider press work area with several “stations” on the front “porch” of the guest apartment. And then…. Cider Day arrived! 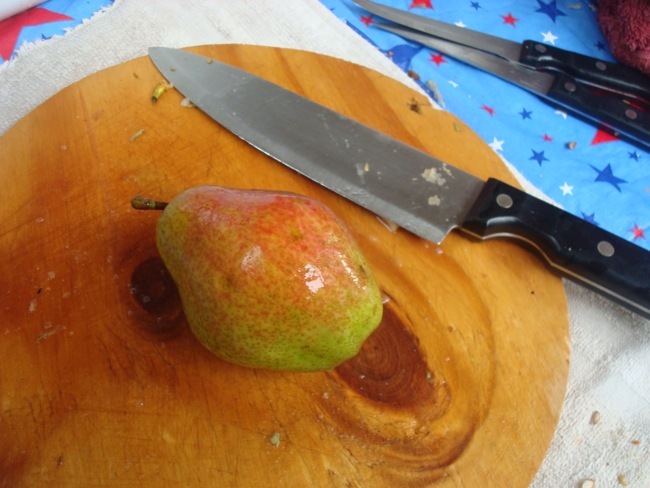 …unless, of course, you were washing pears. 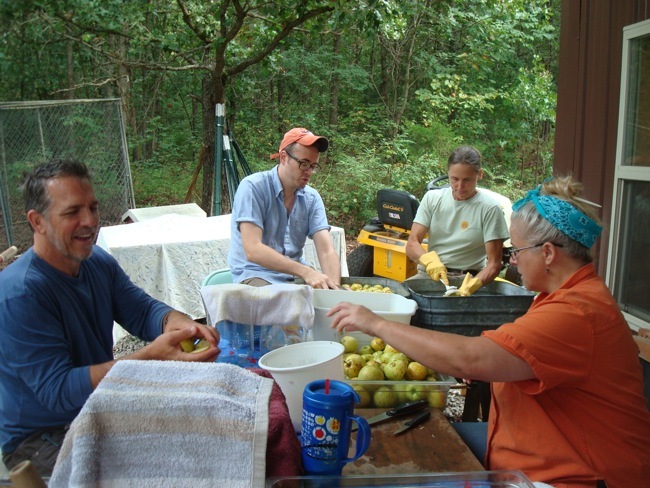 Washing pears was really tedious and Brandon did most of them because, clearly, he’s a real flesh and blood saint. 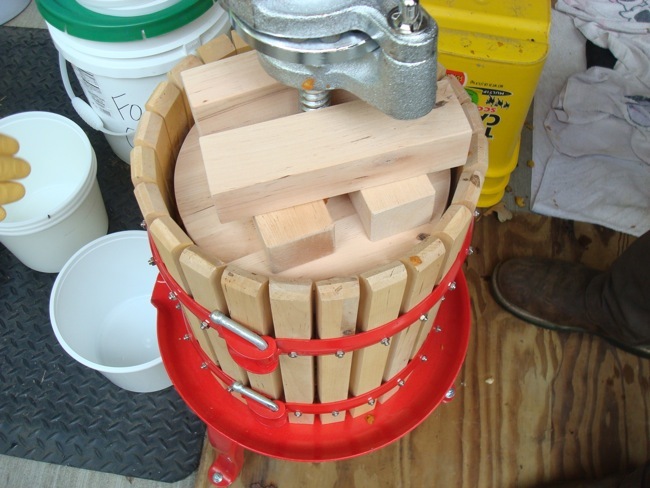 The rest of the press line included: a station for cutting off bad parts and slicing the fruit into quarters; a bin by the press to hold the prepared fruit; the crusher – a brand new red and chrome number that pre-smushes the fruit; the press – a slatted barrel with a grooved core and wooden bricks that help compress the fruit evenly; several clean food grade buckets to catch juice, crushed fruit and pomace (the remnants of fruit and cores which have been pressed); a sieve to strain any solids out of the juice; pre-cut cheesecloth squares to keep dust and flies out of the cider while still allowing it to get the air needed for fermentation; and, a load of glass jugs and jars in which the cider would be made. The crusher and press turned out to be not so great. So, if you are thinking about obtaining a crusher + press, I’d go for the ones made decades ago with real, non-rusting, non-corrosive metals and solid design. In the end, I think we made close to 20 gallons of cider. 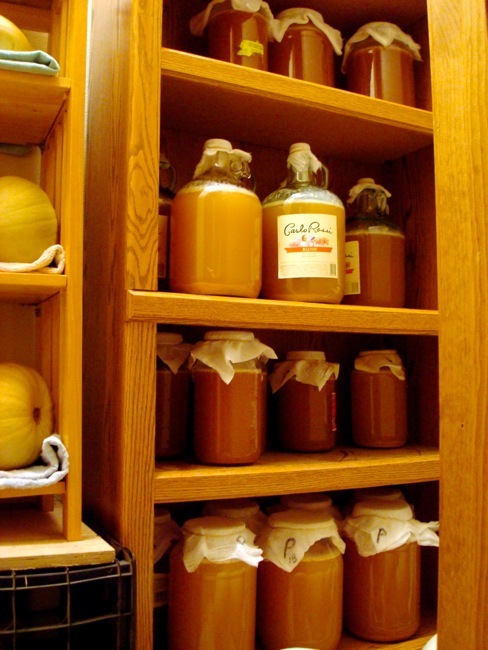 Wendy put the jars in a cool dry closet to start the fermentation process. 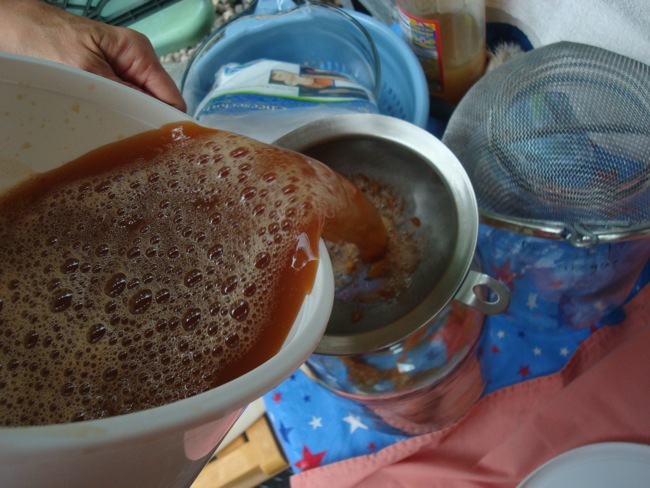 Some of the fermented juice would be made into vinegar and some into hard cider, an alcoholic drink like boozy fruit soda or fruity light beer. 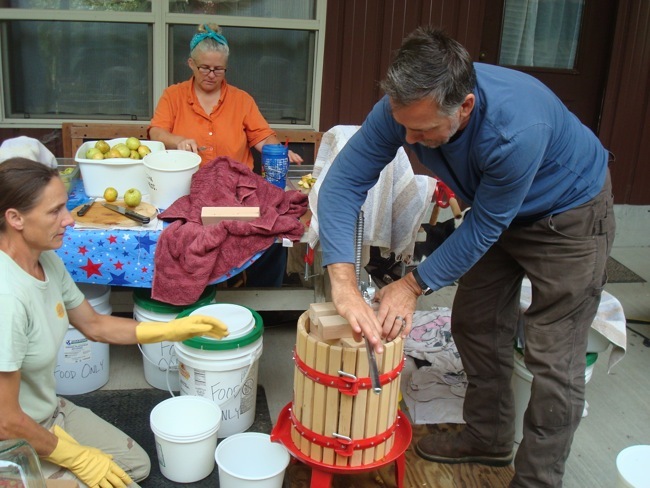 We also drank homemade hard cider at Herkimer’s Hill Farm in Vermont and when we were in Stelle, IL, I also helped with cider making and it was a very different process. There, trees were shaken so that ripe apples would fall to the ground where gigantic tarps had been spread. 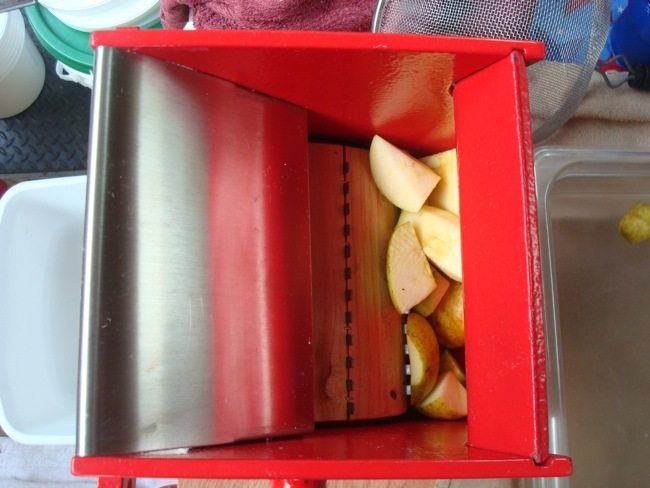 We scooped them into bushel baskets, soaked them briefly in water and then threw the whole apples – cores, seeds, stems and all – into the crusher. The idea there is that neither the crusher nor the press would ever pierce a seed or a stem, so you don’t have to worry about removing them. Also, pears bruise easily, apples, not so much. 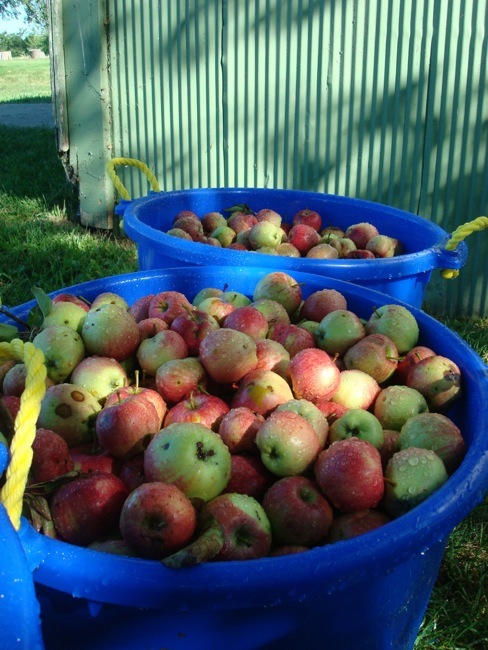 So, dropping them to the ground does little damage that is perceived in the final juice or cider. 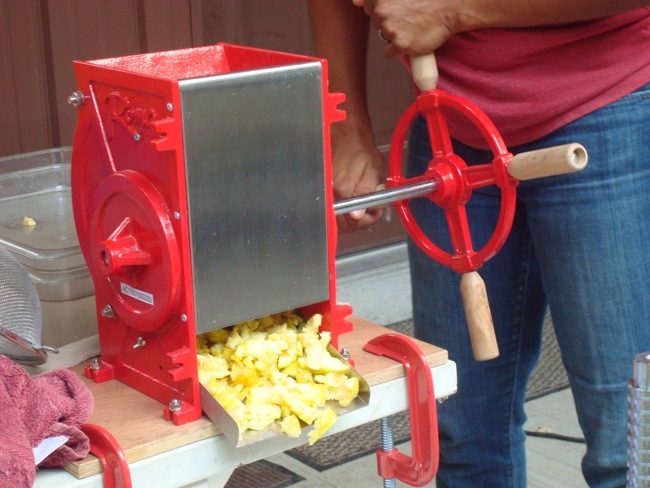 Thusly, 3-4 people picked and pressed 4 bushels of apples in Stelle in about 6 hours as opposed to Falcon Ridge where 3-5 people picked and pressed 10 bushels of pears and apples in 3 about days. Clearly, different methods are implemented according to different priorities, as in all things farm related. When we were in Vermont, permaculturist, Buzz Fervor treated us to something called applejack. Applejack is made by successive freezing of hard cider in which the alcohol is extracted – kind of like cold distillation but simpler. The cider is frozen and whatever doesn’t freeze – the alcohol – is poured off. The pour-off is then frozen again and the alcohol poured off of that. Then, the process is repeated a third time. What you have left is fire water with a slight apple taste. Not at all like calvados, which is a brandy made from apple pomace by an entirely different method. Surrounded by sugar maples spreading high up into the mountains and sipping applejack and water, it’s easy to imagine the loggers and trappers, Acadian, French, English?, who carved their trails in the great forests of this region, taking small nips of applejack as they worked on icy days and getting schnockered at night next a roaring fire amidst a pile of bear and beaver pelts! And that’s how I came to discover the fascinating historical background of hard cider. 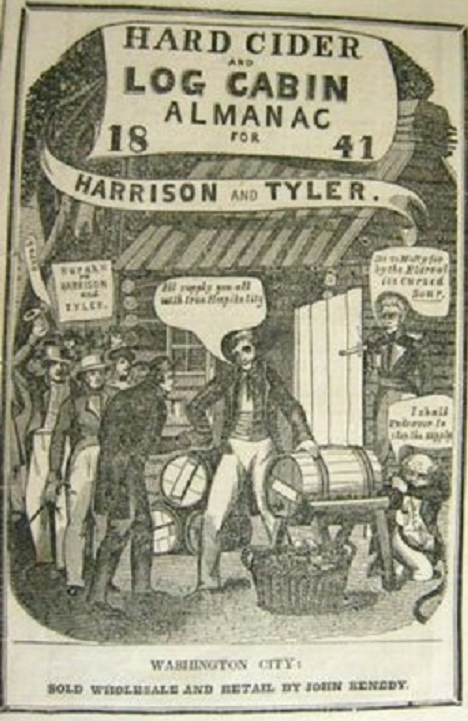 Even though the apple and pear varieties that spread across the nascent country were introduced by immigrants from France and England, you could say that hard cider and apple jack helped fuel the foundation of the early States. Not only were settlers very fond of hard cider, which you can make in about three months, some homesteaders were required to plant fruit trees to prove their rights and ownership to the land under their feet. In those days, hard apple cider was the beverage of choice, alcoholic or not. Settlers believed it had beneficial medicinal qualities, apple harvests were plentiful, and unlike apple juice, both apples and hard cider stored well for months. We have very few great American folk legends, but Johnny Appleseed is well-known for helping the spread of apple trees in the early states, especially in the Pennsylvania / Ohio / Illinois area. I love the idea of the wandering bare-footed, proto-hippie spreading love and planting apple seeds wherever he went. In reality, John Chapman of apple fame, was purported to be a missionary of sorts and bought small sets of acres, scattered all over the midwest. In these he created apple tree nurseries. Once established, he would leave the nursery in the care of a neighbor and return in a year or two to tend to the trees. 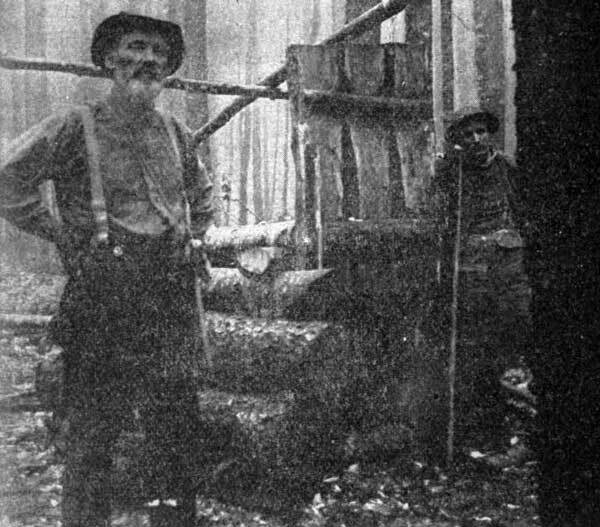 The saplings were sold by the neighbors to settlers eager to secure claims to their land (and to a steady source of alcohol.) This meant he was constantly on the move and growing apple trees wherever he went. At the end of his life he passed on 1,200 acres of nurseries to his siblings and their families. Reports and the man himself claimed that he had warm relationships with every one of the Native American tribes he encountered (not an easy feat for a white man in the early 1800’s) because they believed that he was one with the Great Spirit; the way he had of living simply close to the land, valuing animals, plants and eco-systems above himself and honoring the laws of Nature over those of man. Which might explain why he preferred wild apples to named varieties and did not believe in grafting. Consequently, most of the apples he’s responsible for were used for making hard cider and not apple pies. Interesting fact about apples: If you plant an apple seed, you have a very slim chance of growing a tree with edible fruit, let alone one of the same variety as the apple from which it emerged. If you want to propagate a particular type of apple, you must graft a scion from the original tree onto root stock. The reason is that apples require cross-pollination to bear fruit. E.g., if a Golden Delicious apple tree is pollinated with Golden Delicious pollen, it will not bear fruit. But, if it gets Fuji pollen it will. So, the fruit is always a hybrid of two varieties. The mother tree will always bear the same type of fruit, but the seeds from her fruit will not. In fact, growing trees from seed is a total crapshoot and much more often than not, you get terrible tasting apples. So, when life gives you sour apples, make hard cider! (And apple jack!) Or cider vinegar! Or all three!